It’s pretty rare for a four-year old game to still receive post-launch support in the form of content updates, yet that’s exactly what’s going on with Giana Sisters: Twisted Dreams. Ain’t just some tiny one-level thing either, as there’s a multiplayer mode now, along the lines of SpeedRunners! It’s pretty darn entertaining too, just like the main game. Considering the high difficulty of Giana Sisters: Twisted Dreams, and its Rise of the Owlverlord expansion, I doubt many are able to speed run it properly. 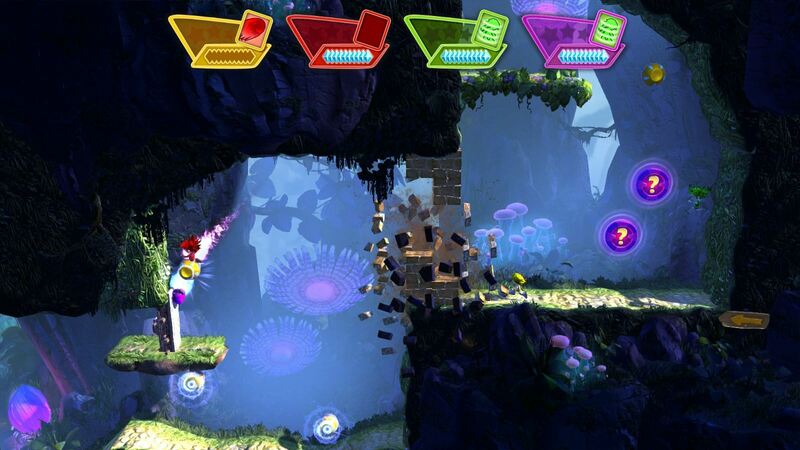 Many will be able to speed past their friends (or bots, which provide quite fierce competition, I might add) however, in the newly added 4-player mode, which contains a grand total of three levels with textures and mechanics from the core experience. Oh, the goal? Simple: finish first by staying ahead long enough for the rest to be eliminated by going off-screen. Fun? You bet. Now, to accomplish this, you’ll have to think fast and react even faster, as each level contains numerous traps and pick-ups, which will either give you an edge, or… well, the exact opposite. From disappearing platforms, hard-to-navigate passages and a twisting world (you’ll see), to items that lets ya do things like speed ahead or trigger a massive explosion, suffice to say, chaos is both present and accounted for here. That and a bit of randomness for sure, but that doesn’t really detract from the fun factor. What does hamper the experience somewhat, is the lack of online connectivity, as the entire thing is local only. It is free though, so I guess one can’t be overly picky. Also, like I said earlier, game’s four years old now, and yet they’re STILL updating it with new stuff, so let’s enjoy what we’ve got instead, which is an entertaining – and chaotic – local multiplayer mode.